For some dog owners, the joy of getting a dog and the pleasure they expected to derive from having a companion animal to love and be proud of is eclipsed by the fact that the animal suffers from separation anxiety. It can’t be left alone without destroying their belonging, sometimes on a scale that is hard to believe. You’ve heard the stories — dogs that destroy their owners’ belongings, even furniture and entire walls to escape being left alone. Separation anxiety is the number one reason rescue animals are brought back to shelters. But it doesn’t have to end badly. There are ways to handle dogs with separation anxiety that change the dog’s behavior, allowing it to be a left unattended. That’s not to say it’s easy. 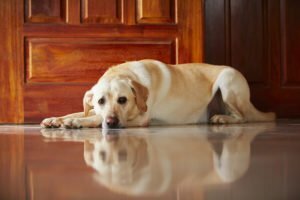 Solving a dog’s separation anxiety issues requires strictly managing the dog’s environment when it’s alone and changing the relationship between the animal and its owner. Just as important as what to do is what NOT to do. For instance, dogs with separation anxiety should not be scolded or physically punished. And owners should not interact with their dogs for 30 minutes prior to leaving it alone. As well, it’s important to not make a big fuss about when leaving as this telegraphs your intention to leave and heightens the dog’s anxiety. That means no free treats or affection, with affection being defined as any eye contact, talking to or touching or petting the dog. · Ignore clingy and attention seeking behavior. · Provide adequate, appropriate exercise and play opportunities. · If the dog is hyper-attached (follows you around the house, often in physical contact), give low-key praise for calm, obedient behavior while not in physical contact with you. · Practice “place training,” rewarding the dog for remaining in a down-stay position in a comfortable resting area as you (with training success) gradually move farther away. · Desensitize the dog to relevant departure cues: pick up keys, purse, or briefcase multiple times per day without leaving, and ignore the dog’s response. · If using a crate or placing the dog in a certain area while you are away, do so for short periods of time while you are home. · If using a crate or placing the dog in a certain area while you are away do so at least 30 minutes before you actually leave. · Leave the dog in comfortable, warm, safe confinement or drop off at dog day care. · Provide “enrichment” (e.g., special chew toy, food filled toy, comfort object) at time of departure. · Be low key on departure. · Be low key when you arrive ignore the dog for 5 to 10 minutes when you arrive home. · Ask your dog to perform an obedience command before giving any affection. Affection is defined as visual contact, talking to your dog or touching/petting your dog. · On weekends and days off practice leaving for a short period of time and coming home. Slowly increase the time you stay away. The time you stay away should be based on the time required before your dog reacts to being alone. Most dogs will react within 30 minutes if they are truly suffering from separation anxiety. Contact us today to talk about any training or behavioral issues you might be facing with your dog. Tropical Dog Training offers a variety of results oriented training programs to target your dog’s specific needs.